Derry Girls the new Inbetweeners? 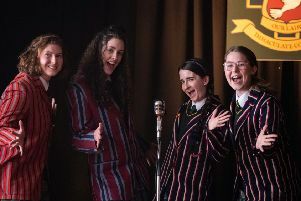 There’s no tougher crowd to please than your home crowd, as Lisa McGee acknowledged when she arrived in Derry to premiere her new ‘Derry Girls’ Channel 4 TV series recently. But there was no need for nerves as the show received a huge thumbs up from those gathered at the special screening. Lisa’s sharp wit and meticulous eye for detail; her ability to create humorous yet believable characters, combined with the attention paid to Derry’s distinctive culture and the political and domestic landscape of the early 90s, makes for an authentic and very funny show. Derry’s representation on TV and film has been up to now, understandably perhaps, largely defined by conflict, but here current affairs and history take second billing as the cameras zoom in on the self-involved, turbulent world of the teenager. Saoirse Jackson as not quite-nerd, not-quite-cool Erin excels with her comedic expression and eye-rolling exasperation at the adults in her life. It’s a credit to the show makers that they didn’t water down the Derry accent either - Erin is as ‘Derry’ as they come. Completing the Our Lady Immaculate School posse are highly strung global justice warrior Clare (Nicola Coughlan), Erin’s pyromaniac and spaced out cousin Orla (Louisa Harland) and the ‘wee English fella’ - Michelle’s cousin James (Dylan Llewellyn) - who gets a baptism of fire and absolutely no sympathy after being shipped off to live in Derry. From bomb alerts on the bridge, thwarting fake tan sessions to Fionnuala, the formidable chip shop woman, the Cranberries to Renault Clio’s Nicole and Papa, this is 90s, Derry-style mucker- a more innocent Inbetweeners set in what were more innocent times perhaps, but no less funny for that.